I will now attempt the impossible -- a spoiler-free discussion of this very twisted mystery (twistery). 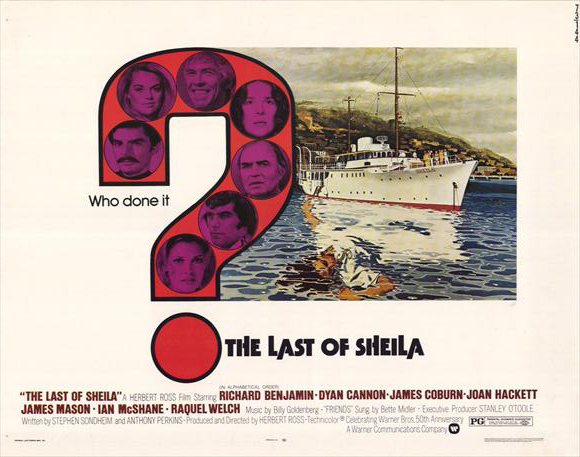 The only known collaboration of Broadway lyricist Stephen Sondheim and actor Anthony Perkins, the screenplay for The Last of Sheila reveals both men’s lifelong affinity for puzzles and games. This film ranks right up there with The Maltese Falcon, Murder on the Orient Express, Chinatown, and The Usual Suspects for twists, turns, misdirection, and stunning “sleuthy” revelations at the very end. 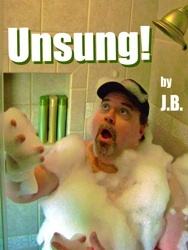 It also earns extra special bonus points for its ironic use of a song over the end credits. You will never believe THAT song made its first appearance in THIS movie. THE PLOT IN BRIEF: Sadistic movie producer Clinton Green (James Coburn) invites six friends to spend a week on his yacht a year after his wife was killed in a hit and run accident. Lured to this “vacation” by the possibility of furthering their careers, the six Hollywood insiders (director, actress, agent, director, a screenwriter and his spouse) agree to play a sort of real-life version of Clue for the entertainment of their host. Is Clinton playing a week-long, mean-spirited joke on these people... or trying to divine the identity of his wife’s killer? Even in a genre overstuffed with nifty plot contrivances and clever plot twists, The Last of Shelia rises above other mystery/detective films to attain a sort of perverse glory all its own. The audience thinks it knows why the game is being played, but the audience is wrong. The film lures audience members in one direction, then pulls the rug out from under them at the half-way point. Once the audience regains its footing and the filmmakers provide a standard all-suspects-in-the-drawing-room reveal, those truths are quickly upended as well, and the film goes off in a third direction. The film nimbly accomplishes these feats too. I do not think any viewers will feel incredulous or cheated by these multiple revelations. The film honestly earns its deceptions through cleverness and intricate plotting. Besides the twisty, twisty script (twistwipt), my other reason to recommend this movie is the cast. Although I have read rumors that Sondheim and Perkins’ apparent mean-spiritedness led to them casting actors they honestly believed to be second-rate has-beens as the film’s bevy of second-rate has-beens, I can not believe that is true. This film stars most of the actors I remember seeing far too much of in the Seventies. I mean, honestly, was there a single film made in the Seventies that did not feature at least one of these actors? Just look at this cast: James Coburn (The President’s Analyst, Harry in Your Pocket, The Muppet Movie), James Mason (Mandingo, Voyage of the Damned, The Boys From Brazil), Richard Benjamin (Catch-22, Westworld, Love at First Bite), Dyan Cannon (The Love Machine, Such Good Friends, Heaven Can Wait), Racquel Welch (Myra Breckenridge; Kansas City Bomber; Mother, Jugs, & Speed), Ian McShane (The Pleasure Girls; Pussycat, Pussycat, I Love You; Deadwood), and Joan Hackett (Rivals, The Terminal Man, Every TV Movie Ever Made). All kidding aside, I love these actors, and they are all perfect in their parts. FULL DISCLOSURE: My faulty, fifty-year-old heart beats a little faster when I think of Dyan Cannon and Racquel Welch wearing bikinis. 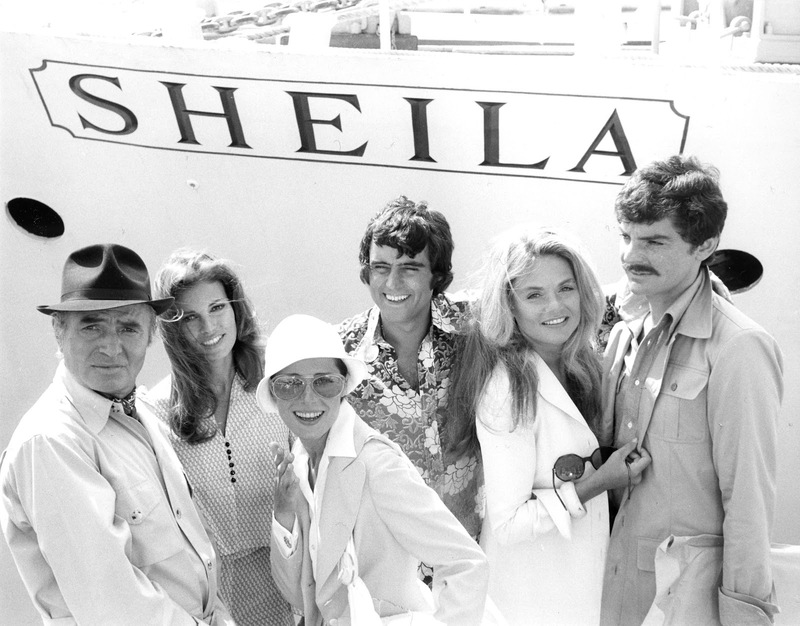 Coincidentally, The Last of Sheila features extended scenes of Cannon and Welch wearing bikinis (kini-scenies). I am sure this is but one of the reasons this little thriller holds a special place in my... uh... heart. Devilishly clever mystery aside, another reason contemporary audiences might embrace this film is its ahead-of-its-time utter amorality. I am not just speaking here of the film’s arch tone or of the Clinton character’s mean-spiritedness and biting sarcasm, but a jaw-dropping lack of scruples that is shared by every character. This is a little unusual for the early Seventies, but I found it one of the film’s more interesting facets when I recently watched it again. You know that you are among some low-down, dirty scoundrels when the revelation that one of them is a child molester is greeted with nothing more than a shrug so the film can continue merrily on its way. BONUS FACT: The very Seventies costumes were designed by Joel (Batman & Robin) Schumacher! This is the only film I have ever seen that utilizes children’s hand puppets for the purpose I have always secretly suspected they are intended for: MURDER. (Would that be “puppder” or “murpet”?) That fact alone should make all of you SEEK OUT this unique film. 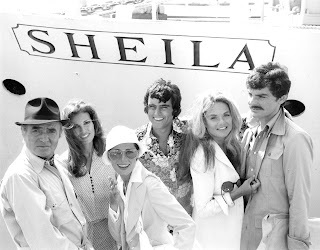 The Last of Sheila shows up occasionally on TCM; it is currently available to rent on Amazon Instant Video and to purchase as a Warner Brothers MOD disc. I caught it for the first time earlier this year and this is a trippy delight, one of those weird little Richard Benjamin roles that I enjoy (another being The Witches Brew with Teri Garr). It's a shame that Anthony Perkins didn't do more outside of acting. He was by all accounts a very witty man, and his direction on "Psycho III" shows a wonderfully quirky disposition. "Split Image", a biography of Perkins by Charles Winecoff, is an essential read for all film fans.